Chicago hitman Cason Bennett and mousy Seattle housewife Juniper Blue have inexplicably switched bodies and lives. A mysterious stranger has called them each to tell them they have to play the game. 'Crosswind' by Gail Simone and Cat Staggs is a juicy satisfying crime fantasy that sizzles with intrigue. Cason and Juniper are forced to play their new roles in their new bodies. Juniper has to clean up a bloody crime scene from the end of the last issue and Cason has to make a killer dinner for Juniper's husband's boss. Their individual instincts take over and they both adapt quickly surprising themselves with the results. Of course, Juniper is living Cason's dangerous thug life and new revelations about him put her deeper in danger. Cason, meanwhile leans on his Cuban mother's recipes to get through the dinner while putting the smackdown on the Juniper's disrespectful son. The familiar set-up opens up opportunities for retribution for Juniper with Cason in her body that just feels so satisfying after witnessing the utter disrespect she received from so many people in her life. It's a predictable outcome but so very delicious to see it happen. With Juniper in Cason's body, it's a whole other dynamic. There are more questions as to how she'll adapt beyond the body removal and cleaning aspect. This is probably the more intriguing story line simply because Juniper has been so weak and passive in her regular life and now has to develop a rigid backbone, supreme confidence and immense courage in light of her new thuggish ruggish lifestyle. It's literally a life or death situation for her. I fully expect her to but how and when is in Gail Simone's hands and I can't wait to see the transformation. If you know Cat Staggs' work you already know it's unlike most comic book art. The photo-realistic character images and dynamic layouts are a joyous and energetic display of virtuosity. If you're looking for common nine-panel pages you'll need to look elsewhere, Cat is putting on a show. Just think of your favorite jazz musician riffing during a solo and just hitting the zone, mesmerized in the moment. That's how I feel when I see Cat's work. 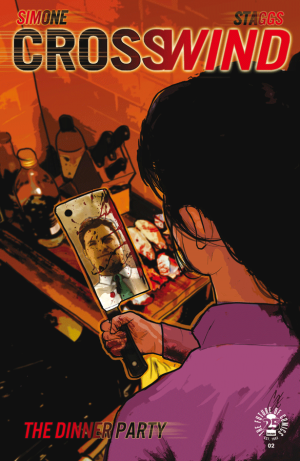 'Crosswind' takes the body-switch trope to new heights with a satisfying second issue that builds directly on the first with a mysterious new player pulling the strings. Meanwhile, Cason and Juniper are forced to step up in their new bodies with a lot riding for each of them. Cat Staggs wows with her unique art style that is fully in sync with Gail Simone's hard boiled script. 'Crosswind' is a bonafide bloody good time.